The fast-growing city of Greenville, SC - situated between Atlanta and Charolette - has garnered worldwide attention for it’s cycling culture. Over the years, the city has focused its efforts on transforming its downtown into one both locals and tourists alike would flock to. With the addition of the 20+ mile Swamp Rabbit Trail, the superb culinary scene, local breweries aplenty and art galleries to die for, what cyclist could resist coming for a visit. As glistening as Greenville is, the city alone can’t take full credit for creating the cycling culture it represents today. Cycling superstar George Hincapie played a major part when he decided to make Greenville his home and training ground in 1999. “I have cycled all around the globe, and Greenville reminds me most of the cycling in California, Spain and Italy,” wrote Hincapie in the forward for Cycling Greenville SC. “The abundance of 4-6 miles climbs, rolling hills and Blue Ridge Mountains are reminiscent of what is found in Tuscany and near my former home in Girona (Spain).” Since then, Hincapie has opened a cycling hotel, started an annual gran fondo, created a high-end sportswear line and coaches his developmental team, all here in … you guessed it: Greenville, SC. So assuming we’ve convinced you to come to Greenville for a grand cycling adventure (let’s not kid ourselves, we both know you’ve already booked your flight) we recommend purchasing a copy of Cycling Greenville SC: Road Biking, Mountain Biking, Swamp Rabbit Trail, Bike Touring to guide you through some of the best cycling in the country. Written by our very own Wendy Lynam and forward provided by Hincapie himself, Cycling Greenville SC will guide you through the best bike rides in and around the city. This guidebook has something for everyone whether you’re looking for rolling hills, steep climbs, flat bike paths or mountain bike tracks. BONUS! Sift through pages on pages of advice and recommendations from leaders of the Greenville community. You want a local’s perspective? This book is just that! What started off as a list of recommended bike rides for Lynam’s guests at The Swamp Rabbit Inn turned into a guidebook for everyone. Enjoy exploring Greenville on two wheels! Do you wish you could take Cycling Greenville SC along on your rides? Now you can with the app version! 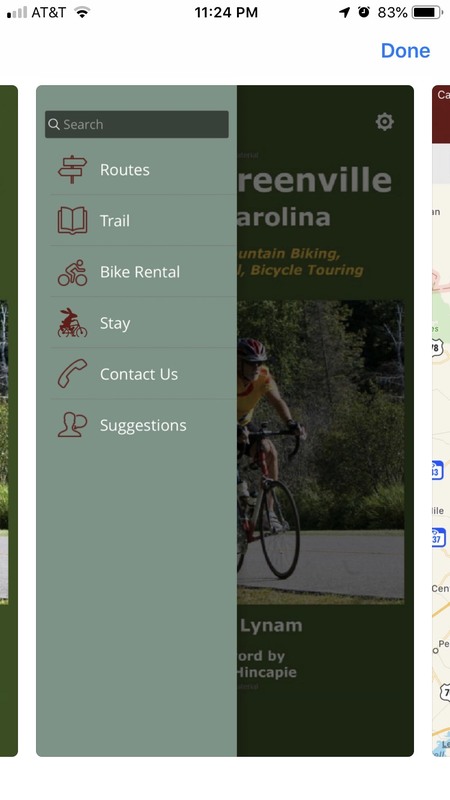 With the Cycling Greenville app - developed by Swamp Rabbit Inn & Properties - you have the guidebook at your fingertips at all times. Pull up the 20+ trails and routes while on the go with turn by turn directions through the Ride With GPS app. Descriptions, ratings and estimated riding times accompany each. If you need a last minute bike rental, just open the app to book a bike from The Bike Shed At The Swamp Rabbit Inn. 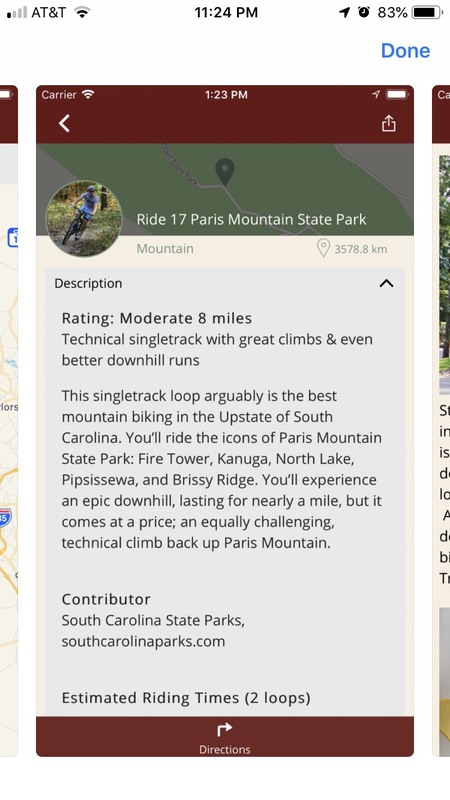 The Cycling Greenville app also lists spots worth stopping at like on the Swamp Rabbit Trail. From the Swamp Rabbit Cafe & Grocery for coffee to Furman University’s idyllic campus to the Swamp Rabbit Brewery in Travelers Rest for a refreshing brew. If you’re headed here for a cycling adventure you might as well stay at the best cycling-friendly hotels which you can also find through the app. All Swamp Rabbit Inn properties are walking distance to downtown and situated on the Swamp Rabbit Trail.